Previously, if you’d asked me what I thought about children going to nursery, I would have said it was the best idea. I would have told you that Lucas went from eleven months old. I would have told you it made him confident, independent and sociable. These are all still true. However, as Sienna begins nursery this week, I’ve felt far more apprehensive about it than I ever thought I’d feel. Our circumstances are totally different this time around. Sienna’s nursery place was booked earlier on in my maternity leave, when I thought (and dreaded) going back to work. When I resigned from teaching, we kept the place. We didn’t really know what would happen, whether I’d be working or not. We didn’t know if we could afford private nursery etc. I also knew that if we gave the place up, we might not get it back if we did need it. In the lead up to her starting, I wrote an Instagram post just before her settling in sessions. It’s a post filled with mixed emotions – exhaustion, apprehension, guilt and worry. Sienna was going through a phase where she constantly wanted to be attached to me, like a heavy extra limb. Lucas is proof that nursery was a good thing for him. He became more confident, independant, he learnt a lot: basic numbers, letters, songs, colours, animals to name a few. Most importantly, he socialised and we’ve never had a problem with him going to pre-school or school. With this in mind, I know Sienna going to nursery, especially considering her clinginess, is going to be good for her. However, because I’m not working (although this may change sooner rather than later – watch this space) I feel guilty about sending her when she doesn’t NEED to be there. I can’t get that image out of my head and, the thing is, it’s not like we have no choice. With me not currently working, she doesn’t HAVE TO go to nursery. However, if you read my New Year Goals post you will know I intend to get a part time job. It would be silly to give up her place. Especially consideringI’m in the process of meeting with a company about a potential job so it could be sooner rather than later. Deep down I know she will be fine. She will soon settle into life at nursery.Sienna is my last baby and I want to make the most of her. At the same time, a bit of childfree time to scope out jobs and work on the blog will be amazing. Can you tell my mind is conflicted? Her first day was last Tuesday and it was very much “swings and roundabouts”. She didn’t cry when we got there. I would immediately think meant that she had bad memories and remembered the last time I left her if she did. She had a nice big smile for me and a cuddle when I returned. I was so relieved about this after her settling in session. It’s so much nicer to be greeted with smiles than tears that aid my mum guilt. She bonded with one of the girls in the baby room. Sienna showed a preference to her and took comfort from her. I’m so pleased about this. I know she’s got someone she will go to if she needs to feel safe. She didn’t eat any lunch. She only napped for half an hour. As I picked her up at 1:30pm, the nap situation wasn’t too much of an issue. She refused to nap when she got home too. If she was there all day, tired, then she could be a bit of a nightmare. It wouldn’t be helpful for the nursery staff, Sienna or me when I got her home. The following few days proved that the lack of eating wasn’t anything to be worried about. She was off her food all week, probably due to teething. What it comes down to is that she needs to go. I’m sure that the more she goes the more she’ll settle in. In fact, I know she will. One thing about Sienna is that she adapts well. Once she is familiar with her surroundings and the people I know she will have a lovely time. Still, it doesn’t stop the mum guilt creeping its way in, does it? Did/have you sent your children to nursery/childminder? How did you feel about it? Did they settle in okay? I’d love to hear your experiences of childcare. Comment below or find me on Facebook, Twitter and Instagram. With my first I didn’t go back to work, as when my maternity ended I found out I was pregnant with my 2nd child – not much point in going back!! However after my fourth I had to go back – luckily I work in the nursery my little one goes too. It’s so hard being the parent dropping them off but I knew that she settled pretty much straight away. It’s so so hard isn’t it. My daughters t didn’t really enjoy nursery but loves school. Ah sending you lots of love! 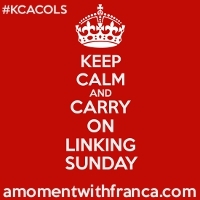 Thank you so much for linking in with us for #kcacols and we hope to see you next time.